Est. 1833. 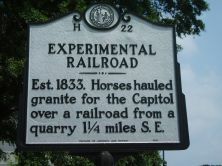 Horses hauled granite for the Capitol over a railroad from a quarry 1 1/4 miles S.E. The Experimental Railroad Company, chartered by the 1832-1833 General Assembly, had as its objective the construction of a rail tracks on which horse drawn carriages could move granite to Union Square. The original State Capitol was destroyed by fire on June 21, 1831. The legislature appropriated $50,000 for the rebuilding of the Capitol, and the cornerstone was laid on June 4, 1833. The first train drawn by a locomotive was not developed in North Carolina until 1840 with the Raleigh and Gaston Railroad. The idea for the Experimental Railroad came from Sarah Hawkins Polk, whose son Leonidas had seen a similar method used in Boston for the construction of the monument for the Battle of Bunker Hill. 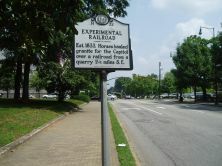 The rail line ran from the a stone quarry to the eastern end of New Bern Avenue, and then west to Capitol Square, for a total distance of around a mile and a quarter. Although the Experimental Railroad was purpose-built for the construction of the Capitol, the owners of the private railroad expanded the business to include leisure use. On Sunday afternoons, folks traveled to Raleigh to ride on the new railroad. Legislators rode the new line while in Raleigh. The Experimental Railroad, along with the newly opened rail line between Petersburg, Virginia and Weldon, proved the feasibility and practicality of railroad development. The growing reputation of the railroad helped to expand interest in the railroad industry throughout the state.